I have no idea why this review didn’t post originally, prob hit the review, then the preview, but didn’t actually send. So I went back to this and re visited some of the best moments. Great book and really worth a listen! I picked this one up a long time ago, and somehow my review didn’t post, so this is a revised review after taking another stab at it, as I also have book 2 now! What I really enjoyed through this book and again in taking another listen was the world building. Of course we all expect in a post-apocalyptic world for there to be many events for the characters to get over, but this was written in such a way that these events were not just breathtaking but so very emotional. 16 years after the event that sends everyone to the seas this story digs down and brings us some events that will really tug at your thoughts. The Catalina and her crew/citizens are forced to act after their ship breaks down, but this causes a lot of grief and internal confusion in what to do, and in the people who might help. I love the characters in here, of course Esther especially who is great with leading and being who she’s supposed to be. they’re all really interesting and fight for all the right reasons. 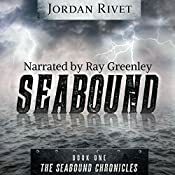 Ray’s tone and style really suits sea bound stories, (hence the Atomic Sea) and I really love the voices for each character that he choose, they bring the story and the people to life in so many ways. There were some interesting accent choices, and one that really made me laugh out loud, but in a good way. No spoilers, I’ve got book 2 to listen to this next week, as soon as I’ve caught up on some others, so many great books released this last week. I don’t know what to pick!